Measuring in at 64cm long…. I’m loving this little blanket. I just hope that the baby who it’s for will love it as he grows. It’s not quite finished yet but soon!! I’ve had a WIP going on for awhile now and it’s starting to take shape! I do like to set myself a challenge though it would appear! A friend asked me if I could make her some attic24 birdies as a decoration my only instructions were you know what colours I like. Aside from that I have creative freedom. Which is ace, but my mind can be a little chaotic so I’ve been working on it in fits and bursts. I’ve had the materials for it for awhile. 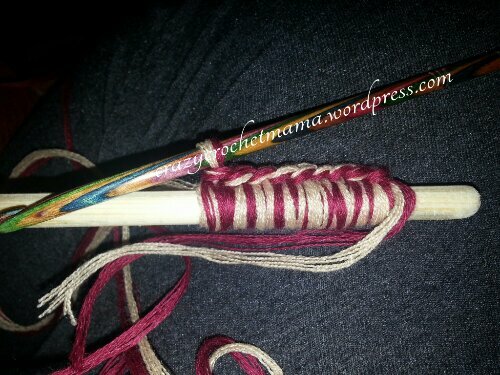 So Matt’s yarn was my back up plan. Although I don’t know why I didn’t think of them first as the colours are perfect, and I love working with cottons! The next step was part of my creative freedom. Aquire a stick! My instinct was to go to hobbycraft. Which as always seems to be the case with me & hobbycraft was an epic fail. The lift wasn’t working, which with a double pram and two children under 2 made me frustrated, without adding in that to navigate downstairs with their narrow aisles! Hobbycraft was abandoned and off to B&Q we went. Why didn’t I think of there first?! So this week I plucked up the guts to embark on this final stage of the decoration…. It was more difficult than I thought it would be to crochet around! 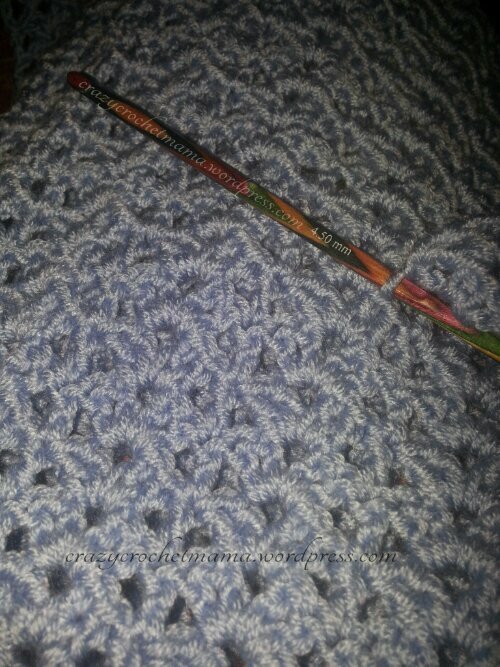 I’ve had to do double crochets and have gone back along the row slip stitching to firm it up a bit. I just hope the finished item lives up to my imagination! 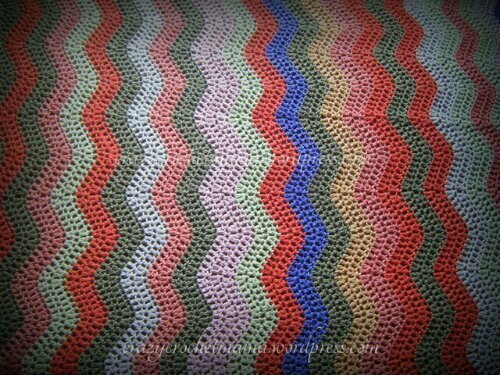 And because I can’t leave you with just one picture… here is the attic24 neat ripple blanket I made for the same person which is why I know her colours so well. It was my first proper bespoke crochet request! I loved making that blanket! I didn’t do a proper edge on it, partyly because it was a huge blanket, but mostly because my crochet confidence back then was low. 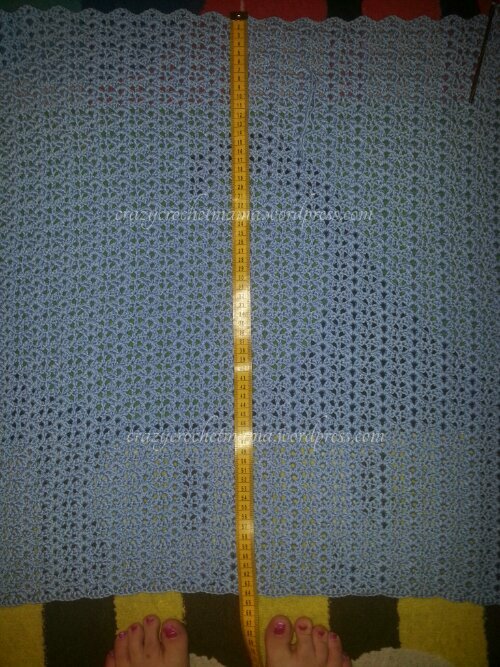 If you want to straighten a ripple blanket I’ve posted how I now do it *here* but if you google how to there are lots and lots of peoples variations on how they’ve done it. I really must go. Mr B has requested steak amd risotto for dinner tonight so I’m trying my hand at an asparagus risotto. I chose the recipe as I’ve had a craving for asparagus!